Juan Guaido, head of Venezuela&apos;s opposition-run congress, spoke in Caracas on Wednesday. CARACAS, Venezuela (AP) — Venezuelan opposition leader Juan Guaido declared himself interim president in a defiant speech Wednesday before masses of anti-government demonstrators who took to the streets to demand President Nicolas Maduro’s removal — a bold move that was immediately recognized by the Trump administration and a growing number of other Western nations. President Donald Trump called on Maduro to resign and said the U.S. would use the ‘‘full weight’’ of its economic and diplomatic power to push for the restoration of Venezuela’s democracy. Canada as well as Brazil, Colombia and several other Latin American nations followed suit in throwing their support behind Guaido. ‘‘The people of Venezuela have courageously spoken out against Maduro and his regime and demanded freedom and the rule of law,’’ Trump said in a statement. The bold challenge to Maduro’s rule came just two weeks after Maduro’s decision to ignore international opposition and take the presidential oath to a second six-year term widely considered illegitimate after his main opponents were banned from running against him. 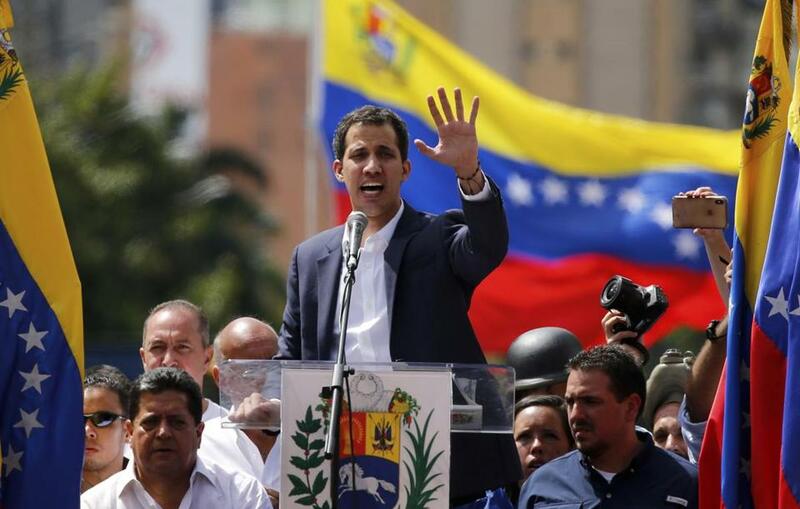 Guaido, 35, said he was taking the politically risky step just two weeks after Maduro took his own oath to a second six-year term because it was the only way to rescue Venezuela from ‘‘dictatorship’’ and restore constitutional order. Guaido’s declaration came as tens of thousands of anti-government demonstrators poured into the streets Wednesday accusing the embattled Maduro of usurping power and demanding he step down as the country reels from a crushing economic crisis that has forced millions to flee or go hungry. Pro-government demonstrators also marched in the capital, at times crossing paths with opposition protesters and shouting ‘‘sell outs’’ and ‘‘traitors.’’ National guardsmen launched tear gas at anti-government protesters in the middle-class neighborhood of El Paraiso but for the most part the marches continued without conflict. In the run-up to Wednesday’s protests, Guaido crisscrossed Caracas attending outdoor assemblies known as ‘‘open cobildos’’ — for the revolutionary citizen councils held against Spanish colonial rule — pumping up crowds by arguing that Maduro must go for democracy to be restored. ‘‘I am absolutely certain that right now, especially younger troops are asking themselves whether Maduro is their commander in chief or a usurper,’’ Alcala said. ‘‘The government is resorting to its old tricks, but the people no longer believe them,’’ Pantoulas said.